How do you rearrange the furniture after moving day? Without the able assistance of movers, we tried to move a heavy Toshiba television. Not one of those modern slim plasma TVs mind you, but a 5-year-old CRT. That big and bulky 200-pound monster was designed to sit in one place. We managed to ease it off the television stand and onto the floor. However, after we moved the television stand, we couldn’t get the television back off the ground. After a few days of meditation, I headed down to the local U-Haul for a Forearm Forklift. I could have gotten a much better price via Amazon, but I didn’t want to wait another 3-4 days. So, with the Forearm Forklift in hand, I headed back home. This time, the television just floated off the floor, much to my amazement. Here’s the big secret. (1) Instead of lifting the television with my fingers, my much thicker and stronger forearms supported the weight of the object. (2) I didn’t have to search around for some non-existent handle or crevice to grab ahold of the television. The lifting straps make it easier to lift heavy objects without obvious places to grab onto. (3) With the Forearm Forklift, I could begin lifting from a position higher off the ground. So, instead of crouching down completely and being unable to generate any lifting power, I started the lift while seated. I didn’t have to lift using any upper body strength. Standing upright was enough power to hoist the television back onto its television stand. I no longer fear the television. 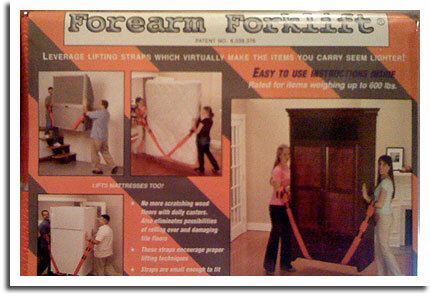 With the Forearm Forklift, we could move it again if we wanted to. It’s also much cheaper than a hydraulic lift table, which was the other solution I was contemplating.